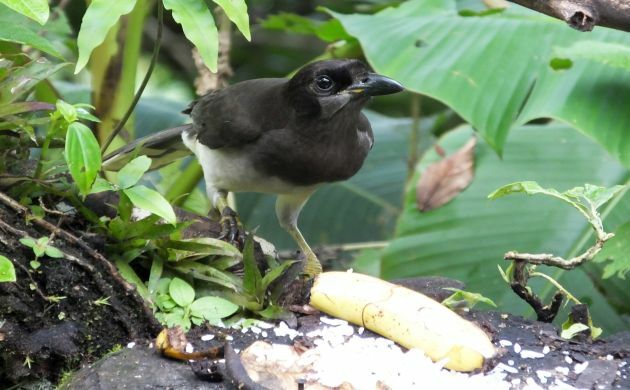 “It’s a Jay”: If you hear a local or guide say this, they aren’t talking about birds like Azure-hooded Jay, the rare Silvery-throated Jay, or the much more common and outrageous White-throated Magpie-Jay. “Just a Jay” means “Brown Jay” because these big corvids are pretty hard to miss. Indeed, some local birders find them so over the top that they don’t even want to look at them any more . What else could those birders be but “jayded”. 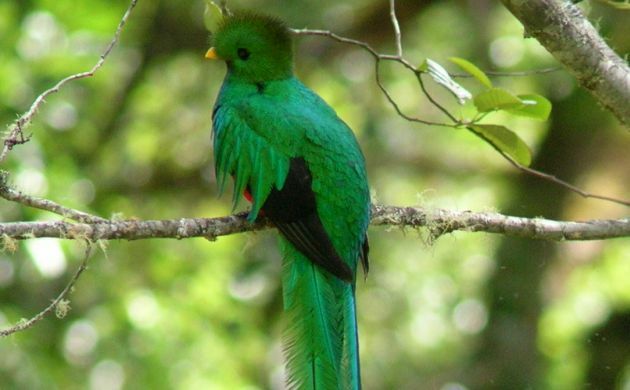 The R. Quetzal: This is one of my suggestions. I guess it’s because I’m too lazy to say “Resplendent”. Well, too lazy, or because every time I say “Resplendent” I feel like I should be birding the halls of Versailles in a powdered wig (actually, the woods near there are alright). Most locals just leave off the “Resplendent” and refer to this mega unbelievable bird as “Quetzal”, and that does work locally but since there are other species of quetzals, I like “the R. Quetzal”. In sounding like the name of a rap star, this also gives the bird a modern, catchy title that befits the fame and splendid appearance. Cerro de la Muerte: Although the literal translation means “Mountain of Death, birders that say this aren’t talking about a triathlon event or place to avoid. They will usually be talking about fantastic highland birding because that’s the real meaning of “Cerro de la Muerte”. Look at that raptor! : Aside from the obvious meaning, it does NOT mean Black Vulture or Turkey Vulture. So, if you hear a guide say, “There’s a raptor!”, he or she is talking hawk, hawk-eagle, kite, and so on. 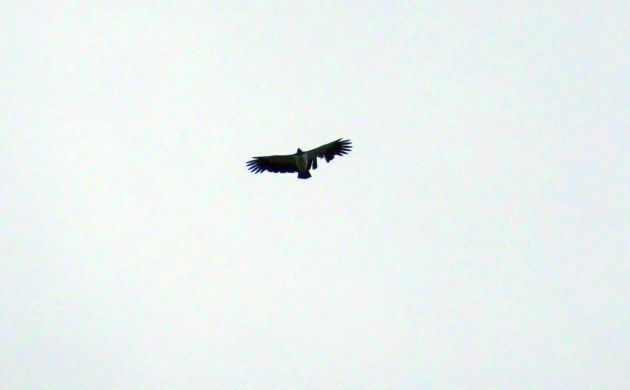 If there are a bunch of vultures soaring overhead, scan them to look for the King, Short-tailed Hawk, Zone-tailed Hawk, Hook-billed Kite, or hawk-eagle soaring with them. A King in flight (King Vulture). The fact that this one can still fly with such a lack of feathers demonstrates why it really is the king of vultures. 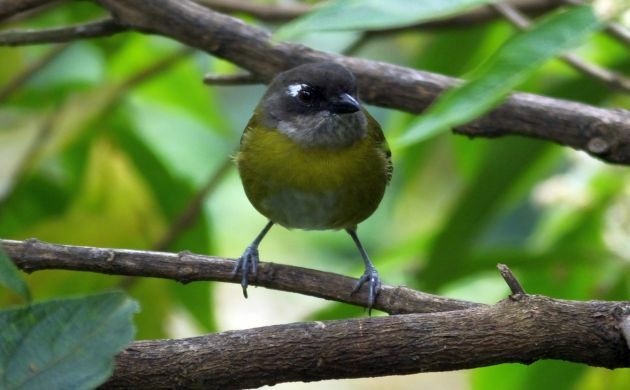 Bush-tanager: It’s not new but I just can’t call them anything else. Sorry AOU, but chlorosping-this! Common Bush-tanager (aka Common Chlorospingus). 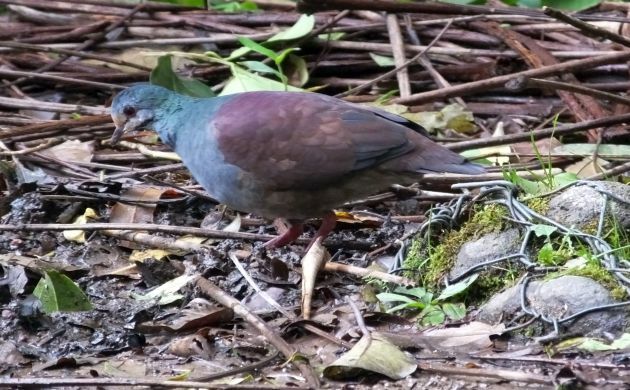 Cool-dove: Another invention of mine (s far as I know), I propose this term in lieu of, or in conjunction with, “quail-dove”. Catch a rare, close look at a few quail-doves and it’s obvious why these beauties are “cool-doves”. Some might also be tempted to call them “pain the … doves” (and that’s often true) but the “cool-dove” name reflects the special nature of these so non-pigeon birds. This Buff-fronted Cool-Dove sometimes hangs out in the Monteverde parking lot. How’s that for cool? Jacamar: In the guide book, there are two jacamar species. We would love to see both. Now, back to reality. 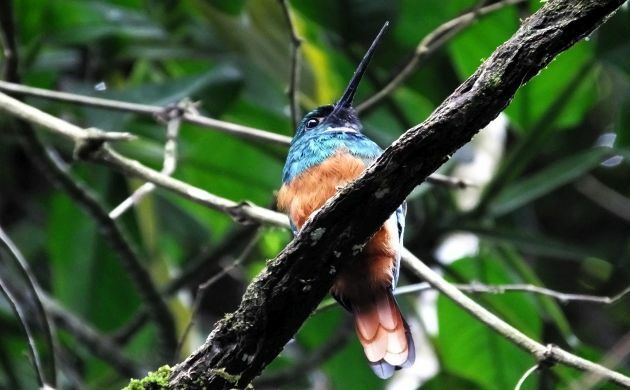 You almost only, ever, see one of those in Costa Rica so when someone mentions “jacamar”, it’s a Rufous-tailed. If the person had actually seen a “Great Jacamar”, this rarity would never be just a “jacamar”. “It’s a Rufous-tailed”: Confusingly, if you hear this, the person probably won’t be talking about a Rufous-tailed Jacamar. 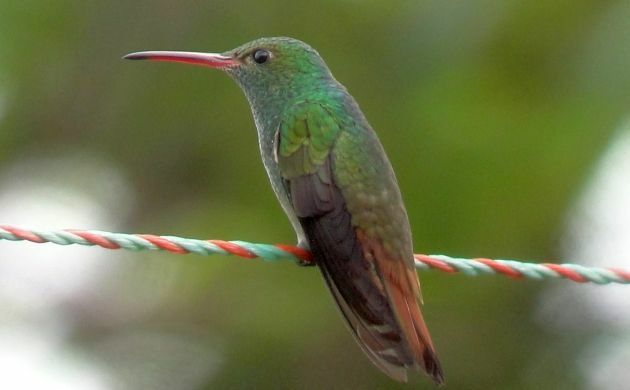 A Rufous-tailed is always a Rufous-tailed Hummingbird, the most common hummingbrid species in Costa Rica. There are plenty of these in Costa Rica. A sparrow: This one depends on how it is said. If “a sparrow” is said in a lackluster, passing manner, it’s a Rufous-collared Sparrow. This is sort of like the House Sparrow of Costa Rica. However, if you hear a local birder say, “SPARROW!”, it’s something along the lines of a Grasshopper, Clay-colored, Lark, or Botteri’s Sparrow. Ironically, you might be more excited about a Rufous-collared, but in Costa Rica, the others are darn good finds. Come to Costa Rica and witness this terminology in action! You will probably see hundreds of cool birds at the same time. Chlorosping-this! I couldn’t agree more. Thanks for the great photos and stories! I am so inspired to visit Costa Rica one day.